History of Adair County, Iowa, and its People, 1915 - Volume 1. Summerset Township comprises all of Congressional Township 75 north, range 32 west of the fifth principal meridian. The surface is generally rolling, with a few ravines in the vicinity of the streams. The soil is rich and loamy and well watered. The east branch of the Nodaway River enters it on the northwest quarter of section 1, and intersecting sections 2, 11 and 14 in a southerly course, it changes to a southwesterly direction and crossing section 15, 22, 21, 28, 33 passes into Richland Township on the south line of section 32. The first person to settle in this township was one Collins, who located on section 2 in the spring or early summer of 1854. He did not remain in this territory for very long, but a grove of trees in that vicinity was named after him. He had signed a note with some men in Madison before he came to Adair County, and the others having fallen out with him, maliciously entered a suit for forgery against him. They sent Otto Davis, the sheriff of Madison County, to arrest Collins. He was incarcerated in the Madison County jail for six months and then went to trial before the District Court, where he was immediately found not guilty and discharged. On coming home he found that his wife had left him and was living with another man. He then left the country and nothing more was heard of him. James C. Gibbs was the first man to make a permanent settlement in the township. On June 18, 1855, the sale of lots in the Town of Fontanelle was begun and Gibbs purchased the lots on the northeast of the square, where he at once constructed a large log cabin. In August of the same year he brought his family here to live. For a few years Gibbs ran a hotel in this log structure. This was the first hotel in Fontanelle. D. M. Valentine bought the lots immediately west of those purchased by Gibbs, built a residence, and thus became the second permanent settler. He was a prominent attorney of the county and afterwards was upon the Supreme bench in the State of Kansas. Gorton N. Bennett came to Adair County August 17, 1855, and was employed until 1857 by J. C. Gibbs as a farm hand. He married Hulda Lee, the first school teacher in Fontanelle. John Lockhart was the next to settle here, coming in the fall of 1855. He located on section 6, where he lived a year or so, and then removed to Kansas. He was a native of Ohio. Azariah Root located in Fontanelle in 1855, where he lived for some time. J. K. Valentine came from Vigo County, Ind., in 1855 and settled in Fontanelle. In 1856 Cal Ballard came and rented the building later used as a postoffice, and placed therein a general stock of merchandise which he had brought from Winterset. This building was constructed and owned by J. K. Valentine. The next year Ballard built a store of his own. In 1859 he sold this to J. C. Gibbs and moved back to Winterset, remaining two or three years, then going to his former home in Indiana for two years stay, when he returned to Winterset and engaged in the dry goods business. When George B. Wilson was elected clerk of the court in 1957 and refused to serve, the judge appointed Cal Ballard in his place. The next man to come was J. D. Nichols, who located at Fontanelle in August, 1856. He was a native of Massachusetts and a carpenter by trade. He lived here for about three years and then went to St. Joseph, Mo. He enlisted in the army at the beginning of the Civil war and won high honors, being placed in the service of the regular United States Army at the close of hostilities. About the same time Theodore Smith and his brother-in-law, Rev. James Walker, came from Connecticut and took up their residence in the Village of Fontanelle. Walker was the first minister of the gospel to make his home in this county. After living here for about four years they left, Walker going to Michigan and Smith to New York. W. B. Hall settled in Fontanelle in the autumn of 1856. He was afterwards elected clerk of the courts and served for ten years. He later went to Seattle, Wash.
A. B. Smith, a carpenter, came to Fontanelle in the winter of 1856-7 and lived her until 1860. In the spring of 1858 he was elected clerk of the courts and held that position until the fall of the same year. He left here and went to Winterset, where he subsequently died. Samuel Marquart came from Wayne County, Indiana, in 1857, and made settlement in Fontanelle. William Lytle made a settlement on section 17 in 1857. He was a native of Ohio. In 1861 he removed to Madison County, from which place he enlisted in the army and during his term of service was fatally stricken with disease. About the year 1857 Samuel W. Armstrong settled in the new Village of Fontanelle. He was a native of Pottsville, Schuylkill County, Pa., and in the year 1856 had come to Adair County from Des Moines and had stayed for two years at Greenfield. He was an attorney by profession. He served for four years as county treasurer. Mr. Armstrong committed suicide in 1866 or 1867. His wife was a daughter of W. H. Brainard, another old settler. J. J. Crittenden came to the township and settled in the Town of Fontanelle in 1857 and was made postmaster. In 1858 he was arrested for robbing the mail, and tried and convicted and sent to the penitentiary for a term of five years. He was pardoned by President Lincoln after he had served two years, whereupon he returned to Fontanelle, lived three years, and then moved to Missouri. Abram Miller located in Fontanelle in the winter of 1857-8 and lived there for several years. He finally returned to Indiana, his native state. Alden Smith came to the town in 1857, but after several years' residence, removed to Winterset, where he died. Abram Platt located in Fontanelle in 1857 and constructed a house which he afterwards sold, and he removed to Missouri. Rev. Joseph Mather, from West Virginia, came to Fontanelle in the spring of 1878 directly from Marion County, Ia. He was the first Congregational minister in Adair County. He died in 1862 at Fontanelle. The next settler was Dr. T. M. Moore, who came in 1858, and settled in the village, there practicing his profession. John Lentz, a native of South Carolina, came from Indiana in 1860 and made a settlement near the Village of Fontanelle. Titus Sullivan settled on a farm near Fontanelle in the early '60s and raised quite a family. He was a soldier in the Mexican war. Briggs Alden, a soldier of the War of 1812, and a Mormon preacher, was an early resident of Fontanelle, where he preached occasionally. He died when nearly one hundred years of age. James Baker, another Mormon elder and a lieutenant in a company of the Second New Hampshire Infantry in the Civil war, was an early resident. He now lives in Lamoni, Ia. The Mormons at Fontanelle belonged to the Joseph Smith branch of the church, although for a time some of them were in Utah Territory. Dr. Nelson Bates emigrated from New York among the followers of Joseph Smith and located at Nauvoo, Ill., and was there at the time Joseph Smith and his brother, Hyrum, were mobbed and murdered at the Carthage jail. He, with his family, were among the crowds which followed the fortunes of Brigham Young. They took the long, toilsome journey across the plains to Salt Lake and there lived for several years. Afterwards, repudiating Young, he was obliged to fly for his life and with his family succeeded in getting away from the Mormon rule and recrossed the plains by team some years before the railroad was built west of Omaha. On reaching Fontanelle he settled there. This was about 1866. He then practiced medicine until his death. He had two sons in the Civil war, one of whom died soon after his return from the army at Fontanelle; the other, Francis M. Bates, became a teacher after the war in a high school in Shamokin, Pa. He came to Fontanelle about 1880 and for a time taught the high school here, also served as county surveyor for some years. He now lives in Iowa City. His oldest daughter, born in the county, married a Methodist minister and the family for some years prior to 1914, were missionaries at Paraguay, South America. Samuel Marquart was long identified with the fortunes of Fontanelle. He was a gold seeker in the Pike's Peak excitement, crossed the plains with ox wagons like most of the gold seekers of that time, and returned "busted." He stopped at Fontanelle, where for many years he farmed, raised stock quite extensively, had a general store and was one of the leading persons in business. In the early days of the Klondike rush he, with D. W. Marquart, his nephew, ex-auditor of the county, undertook to get through to Dawson by way of White Horse Pass, but the snows of the mountains proved too great an obstacle. Some of the party gave out and the rest finally got back, but D. W. Marquart did not long survive. Samuel Marquart went to Lake Arthur, La., where he bought a large tract of rice land and engaged extensively in raising rice, irrigating with large steam pumps. He also extensively developed his town property, of which he is a large owner. He is represented to be hale and hearty today at the age of about eighty years. Abram Rutt helped to survey the Town of Fontanelle and was one of the first carpenters to build houses from the native lumber. He freighted supplies with several ox teams to Denver during the Pike's Peak rush. He was a leading merchant in Fontanelle for many years and was part proprietor of the Fontanelle Register, the only paper published in Adair County for ten years, was owner of a section of land in Walnut Township which he afterwards developed into one of the best farms in the county. He bought a large interest in a big distillery at Atlantic, Ia., but the law and sentiment of prohibition put this out of business. He started and conducted during his life a bank at Casey, first as a private bank, afterwards the Abram Rutt National Bank, which was very successful. He died in 1914, leaving a large estate and large bequest to educational and charitable institutions. G. F. Kilburn came to Fontanelle in 1858 from Des Moines, where he had studied law with C. C. Cole, afterwards a judge in the Supreme Court. Kilburn practiced law, edited the Fontanelle Register, the latter for ten years or more, or until the Greeley campaign of 1872, when the paper was sold to a syndicate and run in the interest of the democratic party for some years by James Rany, G. F. Kilburn served in the Twelfth General Assembly, representing the counties of Adair, Cass and Montgomery in the House of Representatives. Upon the removal of the county seat he moved to Creston and there practiced law until his death in 1883. Col. James Rany, another early settler in Fontanelle, served in the War of the Rebellion and rose to the rank of lieutenant-colonel in an Illinois regiment. After the war he removed to Adair County and was elected county clerk in 1868, beating W. B. Hall by one or two votes and getting the office only after a contest and recount. He remained in Fontanelle as a farmer, stock raiser and shipper, editor and other positions until he moved to Marengo, Ia., where he died several years ago. He was at one time democratic candidate for representative. G. F. Kilburn was born in Boscawen, N. H., in 1834. He came to Des Moines, Ia., in the hard times of 1857, where he taught school and studied law with C. C. Cole who was afterward Supreme Court justice. G. F. Kilburn moved to Fontanelle in the fall of 1858, forming a law and land office partnership with S. W. Armstrong. Later the partnership was dissolved and Mr. Kilburn developed a good business in land and tax paying in addition to the law business to which he still clung. He was a partner in the general store of Kilburn, Rutt & Company for a year or more and for ten or a dozen years was editor and proprietor with Abram Rutt of the Fontanelle Register, the first paper published in the county. He was county treasurer in 1864-65. He was elected representative to the General Assembly in 1867 and served in the Twelfth General Assembly. He was also for several years a trustee of the state agricultural college. In 1875 his wife, Jennie A. Mather, was the victim of a fearful accident, being burned to death by a kerosene explosion. The same fall he removed to Creston, where he opened a law office. He was largely interested in the Creston and Northern Railroad, was secretary of the company formed to build it, and was principal agent for securing the right of way. This road was afterward taken over by the Burlington people. He died at Creston in 1883, from tuberculosis contracted while working for the railroad people. James Rany came to Fontanelle soon after the War of the Rebellion. He had served in a Illinois regiment and rose to the rank of colonel, but was obliged to resign before the close of the war on account of ill health. He served two terms as clerk of the court for Adair County. In the campaign of 1872 he joined the democratic party in support of Horace Greeley for president and in company with several others purchased the Fontanelle Register and changed the politics of the paper. He was also democratic candidate for representative in 1873. He later bought the interests of the other partners in the paper and conducted it alone, finally moving it to Stuart and published the sheet there for part of a year. After he had sold the plant he returned to Fontanelle and engaged in shipping stock for some years later going to Marengo where he died. N. S. Taylor was one of the very early settlers, for some years keeping a stage station on the Des Moines and Council Bluffs route, two miles west of what is now Fontanelle. He moved to Fontanelle after its location and lived there many years. He and his wife celebrated their golden anniversary in 1889 and a few years afterward he moved to Casey to live with his daughter, where he died. J. M. Joseph came to Fontanelle from Ohio about 1866 and was deputy treasurer under T. M. Moore, and afterwards engaged in the land business and as county surveyor. He moved to Creston and purchased a large farm near there which he conducted for some years. He was the populist candidate for governor in 1893. He served one or more terms as clerk of the courts in Union County and later moved to Colorado. John H. Bailey was an early settler in Fontanelle, in law partnership with W. B. Hall who was clerk of the court in 1867. Mr. Bailey was a strong democratic politician and was elected county auditor in 1871. He was the principal in a famous lawsuit in which the county sought to recover moneys which it is claimed he had failed to account for. The trial lasted nearly three weeks and resulted in only a small judgment against Bailey. After the removal of the county seat from Fontanelle he emigrated to Kansas, where he became a judge before he died. One of the most prominent early settlers of Fontanelle was Henry Grass, an attorney, who came there in 1867 from Illinois. He was a fluent speaker and strong political worker for the republican party. He was very much interested in horticulture and town improvement and served several terms as mayor. He moved to Texas where he is still living at a ripe old age, and still active in public duties. Wesley Taylor served in a Pennsylvania regiment during the Rebellion and came to Adair County at the expiration of his term of service. He was county superintendent one term and recorder three terms, was engaged in business several times at Fontanelle and had a farm at the edge of town on which he lived. He was part owner of the Farmers Bank, a private institution which unfortunately failed in 1890, a serious blow to the interests of Fontanelle. Mr. Taylor emigrated to Oklahoma and was in the first run for locations when that territory was opened for settlement. He secured lots in the new plat of Perry, where he built a home and became quite prominent. He met sudden death while on public duty in that state. William B. Martin was a native of Vermont, was there reared and educated, and followed teaching and farming until the spring of 1867, when he went to Henry County, Ill. In April, 1869, he came to Adair County, and located on section 5, Jefferson Township, and there farmed and taught school until his election to the office of county auditor in 1874, wherein he served two terms. He was clerk of Jefferson Township for several years and was for a number of years a member of the city council of Greenfield. Mr. Martin was elected to represent Adair County in the Twenty-fifth and Twenty-sixth General Assemblies, and subsequently was secretary of the state of Iowa for three terms. He is president of the Iowa Trust and Savings Bank at Des Moines at the present time. John A. Storey, attorney, is a native of Pennsylvania, farmed and taught school in his home state, and in 1874 graduated from Washington and Jefferson College, Pa. After leaving school he taught until the summer of 1875, then came to Iowa and located in Greenfield, Adair County, and the next year was admitted to the bar. He was sent to the Legislature in 1883, representing Adair County two terms there. He was also appointed judge to fill a vacancy by Goad Jackson in 1898, serving the balance of the term. He afterward removed to Omaha, Neb., where he continued in the practice of law for some years. He then went to Indianola, Ia., and engaged in the banking business. Captain Charles Stuart was born in Vermont and in 1867-68 he purchased several large tracts of land in Adair County. He laid out the town which bears his name on the Rock Island Railroad in December, 1967, and contributed much to the early growth of that place. In 1873, he founded the Town of Adair, where for more than ten years he carried on an extensive business. The development of Lincoln Township in Adair County was largely responsible to Captain Stuart. The first marriage in Summerset Township occurred on June 15, 1857, and was that of Homer Penfield and Martha Campbell. the first death was that of Justice A., the son of James C. and Phoebe L. Gibbs, who died on September 29, 1860. This was the first person buried in the Fontanelle cemetery. The first school was taught by Miss Hulda Lee in 1857 in the Town of Fontanelle. The first sermon was preached in the fall of 1856 by Rev. James Walker at his own house. The first child born was a son of Daniel M. Valentine and wife, in April, 1856, at Fontanelle. Summerset Township was organized in the spring of 1856 and the first election was held on the first Monday in April of the same year. This election was held at the house of D. M. Valentine, on the north side of the square, in the Village of Fontanelle. The first officers were as follows: Jacob Eby, Alfred Jones and Joshua E. Chapman, trustees; D. M. Valentine, clerk; J. C. Gibbs and Azariah Root, justices; Abraham Rutt, assessor; Gorton H. Bennett, road supervisor; James S. Ewing and G. N. Bennett, constables. The first meeting of the board of trustees was held on March 15, 1857; by many people this record is doubted. The story of the birth of the Town of Fontanelle has been related in another part of this history. However, the fundamental facts will bear repeating. The General Assembly of Iowa appointed special commissioners to designate a seat of justice for Adair County and in the spring of 1855 these commissioners met and selected the spot now know as Fontanelle. The county judge, G. M. Holaday, thereupon journeyed to Council Bluffs, to the land office, and entered in the name of the county the southwest quarter of section 17, township 75, range 32. On this the original town, consisting of thirty-one blocks, was laid out and under the name of Summerset was platted and placed upon the records of the county on May 30, 1855, in the name of Adair County. 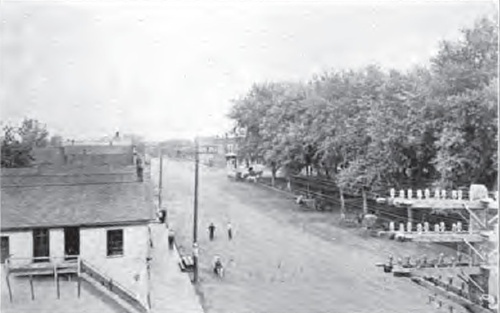 On June 18th of the same year the lots were placed in the market and the sale of them started. The name of Summerset was shortly afterward discarded in favor of Fontanelle, although the first time the town is mentioned by that name on the records is under the date of June, 1857. The first house was constructed by James C. Gibbs in the summer of 1855. It was built of logs and was for a time used as a hotel. The second house to be built in the village was that of D. M. Valentine, during the same year. 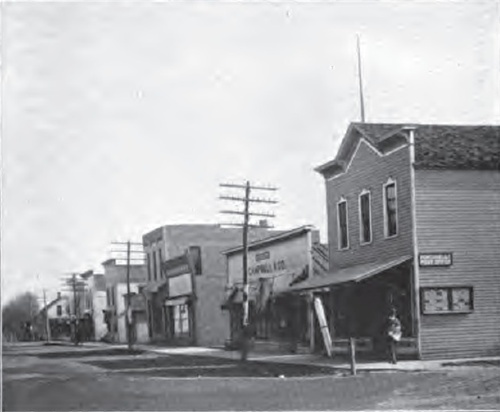 The first goods to be sold in Fontanelle were owned by Cal Ballard. He opened a general merchandise store in 1856 in a small building built by James K. Valentine, and which was later used as a postoffice. He conducted his business for about a year and then sold out to Abram Rutt, of Casey, who moved the goods from the town. The second merchant was James C. Gibbs, who purchased the Ballard store and stock and conducted the business during the years 1859 and 1860. The first hardware store in the town was started in 1871 by F. A. Blystone. 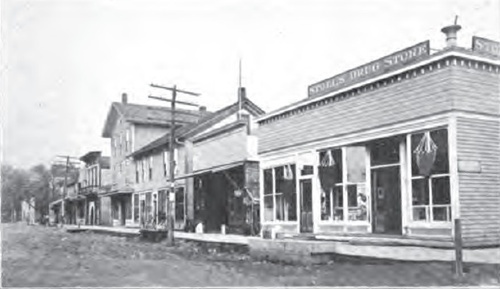 John S. Sherdeman began the implement business here in 1879. The pioneer blacksmith in Fontanelle was Charles White, who opened a shop in the east part of town. The second was Alfred Jones. The Farmers' Bank of Fontanelle was instituted in the spring of 1879 by James L. and B. Lombard, both gentlemen from Galesburg, Ill. J. M. Osterlind was their cashier. In 1880 they sold the building to Wesley Taylor, R. E. Ewing and J. C. Gibbs and then removed from this county. The three new proprietors at once started upon the banking business and chose the following officers for the first: James C. Gibbs, president; R. E. Ewing, vice president; Wesley Taylor, cashier. In the autumn of 1882 J. C. Gibbs sold his interests in the bank to his partners, who continued it until September, 1883, when a new organization was effected by J. H. Hulbert, of Fontanelle, and James Jackson, of Chicago, each purchasing a fourth interest. In 1882 a fine building was erected on lot 1, block 26. This bank failed in March, 1893, with almost a total loss to depositors. The Exchange Bank of Fontanelle was started in the early '80s. D. Heaton was the president and Alexander M. Gow the cashier. In 1883 the institution constructed a bank building on the corner of Main and Washington streets, at the southwest corner of the square. This bank was reorganized as the First National Bank on January 1, 1904, with first officers as follows: J. S. Hulbert, president; J. H. Hulbert, vice president; W. F. Johnson, cashier; R. R. Tuttle, assistant cashier. The bank has had a steady and reliable growth since this time and enjoys the fullest confidence of its patrons. The capital stock is $25,000, the surplus $10,000 and the deposits average $223,000. J. F. Baudler is president; C. D. Walsworth, vice president; E. R. Faurote, vice president; and W. A. Addison, cashier. The State Savings Bank of Fontanelle was organized on August 26, 1905, by C. A. Baker, Charles T. Launder, Henry Hyda, W. J. Simpson, Dr. C. B. Scott, L. M. Lyons and D. N. Dunlap. The first officers were: L. M. Lyons, president; Charles T. Launder, vice president; C. A. Baker, cashier. The present officers of the institution are: Charles T. Launder, president; Henry Hyda, vice president; C. A. Baker, cashier; H. J. Stuhlmiller, assistant cashier. The capital stock is $10.000, the surplus $5,000, and the deposits average $130,000. The building was erected by C. A. Baker prior to the organization of the bank at a cost of $3,200. This young institution has a good patronage and well merits the esteem and confidence of the people. In February, 1879 the Gow Brothers established a paper with the above name in Fontanelle. The paper was a seven column folio with patent outside and had a small patronage. James M. Gow, who was at that time editor of the Adair County Reporter at Greenfield, had editorial charge of the paper. They continued as proprietors until February 27, 1881, when it passed into the hands of M. A. Rany. During his ownership Will Pruitt also ran the paper under lease for a few years. In August, 1894, W. H. McClure became the owner and publisher of the Observer and continues in this capacity in 1915. Illness at this time prevents his active attention to the sheet, but this is ably supplied by his son, D. D. McClure. A handsome brick building, a cut of which is appended, was erected in June, 1918, at a cost of $2,000. The paper is issued on Thursday of each week and is an eight page, six column sheet. The Observer plant also does an extensive job printing business. The Fontanelle Register was first established in 1862 by J. C. Gibbs and soon afterwards was sold to Kilburn & Rutt who conducted it until 1972, when it went into the hands of James Rany and others. It was edited for a few months by Mr. Caton, then county superintendent of schools, afterwards by Mr. Rany who finally moved the plant to Stuart. Later it was brought back to Fontanelle and conducted by M. A. Rany, a son of the former editor, under the name of the Observer. The story of the paper from this point is in the leading paragraph. Gow Brothers & Gibbs established the Fontanelle Reporter in 1879; J. M. Gow was the editor. A year or two later Gibbs sold his interest to the Gows who removed the paper and press to Greenfield after the county seat was moved to that place and continued its publication until some years after, when it was merged with the Transcript and continued under that name. When the county seat was removed from Fontanelle to Greenfield there were many who predicted that it would mean the end of the town, that it would deteriorate and crumble into decay. The opposite has been the case. Business has thrived and has reached a very high point, in fact, equal to any other town in the county. The reason for this, principally, is the live spirit of the citizens, their desire to make the town prosperous and to create a community of interest, civic improvement and financial welfare. Illustrative of this progressive attitude was the formation of the Fontanelle Commercial Club on July 1, 1914 by the business men. The first officers of this organization were: E. W. Adams, president; W. A. Addison, vice president; H. J. Stuhlmiller, secretary; and C. A. Baker, treasurer. The club has continued to boost the town and is a strong factor in the success of Fontanelle. In 1913 the city erected a system of water works, which cost them the sum of $20,000. The contract was let to the Alamo Engine and Supply Company of Omaha, Neb. Wells were dug and a water tower erected which has a capacity of 50,000 gallons. Electricity is supplied by the Greenfield plant. Fontanelle owns its own transmission line and has the benefit of continual service. There are forty-nine street lights and twelve five-light ornamental electroliers. Another notable improvement of the year 1913 was the erection of a $2,500 town hall. The postoffice of Fontanelle was established in the spring of 1856 and James C. Gibbs was commissioned postmaster. The postmasters since this time have been: Cal Ballard, J. M. Crittenden, R. O. Brown, A. Root, F. B. Marquart, M. M. Rutt, F. B. Marquart, M. A. Rany, J. Bahlman, George Rodgers, W. H. McClure for sixteen years, and J. Sullivan. The story of the robbery of mails committed by Crittenden is related elsewhere. On July 1, 1884, the office was made an international money order office. It has been noted that James C. Gibbs kept a pioneer hotel in his own house. The first hotel built for the purpose was the Pacific House erected in 1859 by J. K. Valentine, who ran it for several years. The Gibbs House was built by James C. Gibbs in 1870 and conducted by him for about a year. The Bradfield House was erected in March, 1879, by A. N. Bradfield. In 1881 a steam elevator was constructed by Daniel N. Dunlap. He came here for the purpose of purchasing grain and the first thing he did was to erect his elevator. A flouring mill was built in 1880, being a frame structure, three stories in height. A creamery was started in 1882. 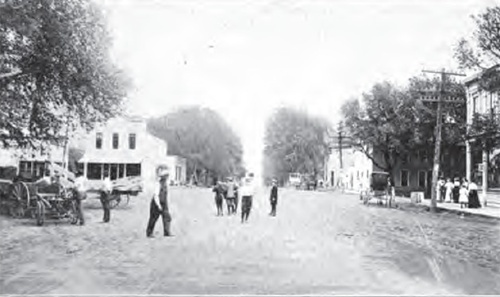 The Town of Fontanelle was incorporated in September, 1881, and the following were the first officers elected: F. A. Blystone, mayor; John J. Hetherington, recorder; A. A. Powers, J. Spain, M. L. Bates, George Miller and Samuel Marquart, members of the council. The first meeting of the council was held at the office of the mayor on September 27, 1871, and the first ordinance passed was relative to the appointment of a marshal and a treasurer. Alfred Drake was chosen as marshal and Nelson Bates as treasurer. Fontanelle Lodge No. 138, Ancient Free and Accepted Masons, applied to the grand master for a dispensation to organize a lodge on June 27, 1858, signed by the following master Masons: Cal Ballard, J. W. Stinman and Azariah Root. The first regular communication of the lodge was held on August 21, 1858, and the following named were the officers: Cal Ballard, worshipful master; J. W. Stinman, senior warden; Azariah Root, junior warden; J. C. Gibbs, treasurer; F. H. Whitney, secretary; John Bixley, senior deacon; William Lytle, junior deacon; Jacob Eby, tyler. St. John's Chapter No. 73, Royal Arch Masons, was organized under a dispensation granted May 22, 1874. The dispensation was signed by R. F. Brown, G. H. P. of the R. A. C. of Iowa. The first meeting was held on the evening of June 8th following. The original members were: J. C. Gibbs, A. M. Norman, W. M. Rodgers, Fleming Saunders, John Taylor, J. M. Gow, John J. Hetherington and T. M. Moore. Fontanelle Lodge No. 250, Independent Order of Odd Fellows, was organized January 27, 1873, with the following charter members: Abram Roberts, John Lattus, C. M. Staley, Peter L. Rice, Samuel Maple. The first officers were elected as follows: Abram Roberts, noble grand; John Lattus, vice grand; C. M. Staley, recording secretary; P. L. Rice, treasurer. Rustic Lodge No. 98, Iowa Legion of Honor, was organized on January 1, 1881, with the following as charter members: James A. Wilson, P. McDermid, L. J. Slocum, C. B. Scott, George A. Davis, P. R. Adams, Robert H. Fox, W. O. Ludlow, W. H. England, W. H. Simmons, A. W. Jacobs, J. W. Holmes, A. S. Venen, Leander W. Wood, Benjamin F. Bennighoff, L. S. Davis and A. O. Longnecker. Lentz Post No. 121, Grand Army of the Republic, was organized on April 6, 1883, with the following comrades as charter members: Samuel B. Yeats, W. O. Ludlow, William Rife, Abner Root, Ithamer Watkins, James Raney, Frederick Gerry, John Puntney, Adam Feiler, D. N. Dunlap, James McCampbell, W. F. Myers, W. E. Duncan, C. C. Evans, E. W. Ward, Jonathan Childs. The first post commander was D. N. Dunlap. The soldiers of the Rebellion living in and about Fontanelle at the present time are: J. J. Campbell, Flay Remine, D. Edwards, L. W. Wood, D. C. Chapman, C. C. Evans, Caleb Eddy, Twombly, Charles Scofield, J. F. Templeman and Robert Sproul. Those buried in Fontanelle cemetery are: J. D. Hetherington, George Lents, Jonathan Childs, Timmons, J. Watkins, C. B. Scott, B. Dwinnelle, Egbert Hawks, Adam Feiler, D. W. Marquart, Art Colwell, Nelson Bates, Jr., W. J. Jacobs, D. N. Dunlap, C. Pettit, Green, Harvey Johnson, D. W. Prewitt, Willis, D. Carver. Those in other cemeteries are: Richland, Thomas Ewing and Abe Smith; Jackson; Abner Root; Prussia, Henry Walton; Eureka, Henry Bloomfield. There are also buried Briggs Alden, a soldier of the War of 1812; Titus Sullivan, of the Mexican war; And Fred Carver of the Spanish-American war.